You'll be £13.50 closer to your next £10.00 credit when you purchase Flight Craft: Avro Lancaster 1945-1965. What's this? Order within the next 8 hours, 15 minutes to get your order processed the next working day! The Avro Lancaster, such a stalwart of the skies during the Second World War, also enjoyed an interesting and surprisingly colourful post-war career. It is this era that the authors have chosen to focus on by profiling the type across its many variants. 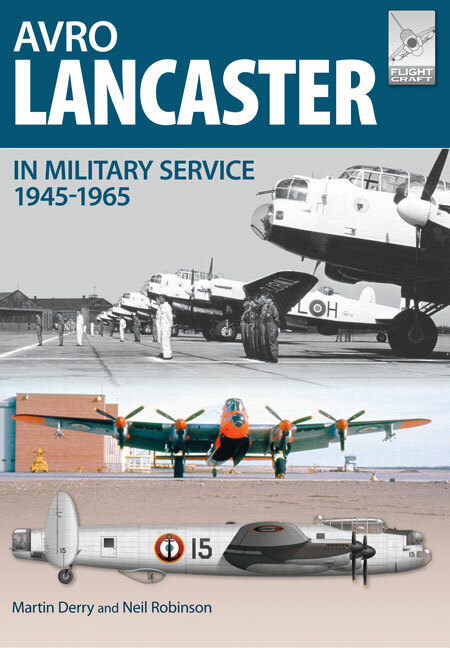 Split into three primary sections, this book offers a concise yet informative history of the Lancaster's post-war operational career (from 1945-1965) charting the course of the various alterations and improvements that occurred during this time and including a selection of contemporary photographs with detailed captions. A 16-page section features 32 colour illustrations (in profiles, 2-views and 4-views) specially prepared by Mark Gauntlett. The book's final section provides a list and box top illustrations of the plastic model kits produced of the Lancaster in all scales plus reviews and 'how to' construction notes on building a selection of kits in 1/144, 1/72 and 1/48 scales. As with the other books in the Flight Craft series, whilst published primarily with the scale aircraft modeller in mind, it is hoped that those readers who might perhaps describe themselves as 'occasional' modellers - if indeed they model at all - may also find that this colourful and informative work offers something to provoke their interests too. ...What I absolutely found interesting is the, although summarised, story about the developments of the for his time heavy bombers. In six weeks – yes, six weeks! – a two engine Manchester bomber (3 tail fins and 24 cylinders(!) Rolls Royce Vulture engines) was rebuild into a 4 engines Lancaster with 2 tail fins. The chosen engine type for his was the 12 cylinder Rolls Royce Merlin, with which also the Spitfire flew. Then the Top of the Pop under the engines! Note: when the Americans developed the Mustang, they had to ask the British for help (RR Merlin engines).The by then in the VS by Packard developed engines could not come close. Conclusive: model makers, for you a real candy box with Lancaster details. There even is an overview of construction box manufacturers admitted, with the by them delivered design variations. The book contains a lot of detailed figures and beautiful colour pictures. This is an excellent guide for the modeller who may not have an encyclopaedic knowledge of the Lancaster but is looking at an interesting approach for a modelling project. Recommended. This book packs an enormous amount of information into a relatively small number of pages and provides some stunning illustration in specially commissioned full colour drawings. At A4, the book provides the size of drawing required by model makers. There is excellent concise text and a wealth of photographs, many of them very rare. There is also coverage of some of the best plastic model kits, together with special components to produce outstanding unique or rare models. A book that should sell very well. Interesting for aircraft historians in that it details the history of this famous bomber after the end of WWII, along with lots of photographs, and for modellers of course some more inspiring sets of camouflage and markings to tempt you into expanding a collection of Lancaster Bombers in model form.